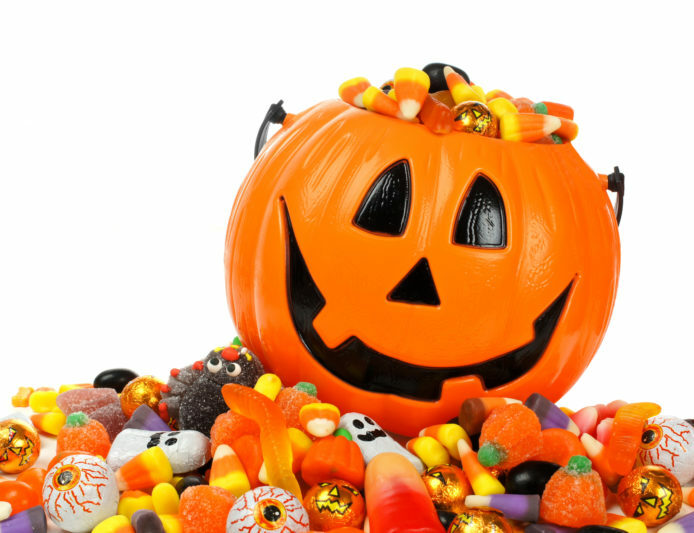 My kids aren’t big candy eaters, probably because I don’t buy it. It also might have something to do with the fact that I magically make their Halloween candy disappear every year. Before you tell me that I can donate it to the troops overseas, I will redirect your attention to the title of the article. I’m a Practical Patty…I prefer to make good use of the sticky sweet swag. First, let the kids eat one to three pieces before they hit the sheets. Then, dump the bags on the floor. Divide it up by types. I typically put all gummy/non-chocolate in a pile together and donate those. They ship better because they can’t melt, and they’re especially bad for kids’ teeth so they’re the easiest to part with. As for the chocolate varieties, see the list below, along with some winner recipes that will delight your family long after Halloween has come and gone. 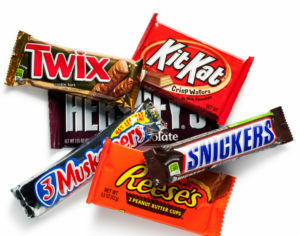 Hershey’s Bars – put in the freezer for next summer; you will be 1/3 of the way prepared for S’mores. KitKat, Milky Way, 3 Musketeers, Mounds and Almond Joy are all perfect for Brownies. Buy your favorite boxed mix (or make them homemade, which is almost as easy) and add 1 cup of the chopped candy to the batter for a total win. Also good – ice cream sundae bar! Invite your guests to scoop vanilla or chocolate into a bowl, and then offer chopped candy as topping options. Snickers aren’t really that much worse than your typical protein bar. Give the full-size Snickers to your spouse to take to work, and freeze the minis for when a hankering strikes. These are also fabulous to bake with, like with this recipe for knock-your-socks off Snickers Bar Blondies. Preheat oven to 350 degrees. Make a foil sling in a 9×13 baking pan and spray with nonstick spray. Whisk flour, baking powder and salt in a small mixing bowl. Whisk melted and cooled butter and brown sugar until smoothly combined in a medium or large mixing bowl. Add eggs, one at a time, and whisk to combine. Add vanilla and whisk. Add flour mixture and fold gently until almost mixed. Add chocolate chips and toffee and gently combined. Spread into prepared pan and bake for 25 to 30 minutes or until golden brown and the top is shiny. Let cool at least 25 minutes in pan and remove, using sling, to cutting board. Cut into slices and store at room temperature until ready to serve. M&Ms. Store in pantry in an air-tight plastic container or in their individual packaging. 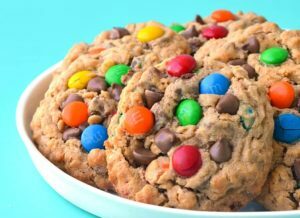 When the holiday baking comes around, you’ll be ready for a batch of yummy Monster Cookies. Heat oven to 350 degrees and line baking sheets with parchment or silpat. Cream butter and sugars. Add peanut butter, egg, and vanilla. Add flour, baking soda and salt and beat on low until combined. Fold oats, M&Ms and chocolate into mixture by hand. Scoop two tbsp. worth of dough onto baking sheet and slightly flatten, making sure to space batter at least two inches. Bake 10 minutes. Let cool on pan until easy to transfer and let cool on wire rack completely before storing, tightly covered at room temperature. 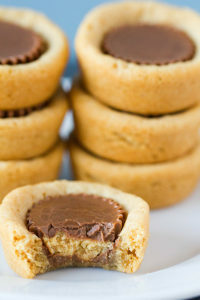 Reese’s Peanut Butter Cups are probably one of the most popular candies brought home, and they too can go to great use. You only have about a month and a half until holiday baking, but fresh is best. So place all mini Reese’s in a Ziploc bag and toss in the freezer. This recipe h as been around for ages, but we can all relate to snagging these off the dessert buffet table…because you know they’re ridiculously good, every single time. Whisk flour, salt, and baking soda in a small bowl. Cream butter, sugar and peanut butter until light and fluffy. Add egg, vanilla and milk and beat to combine. Add dry ingredients and slowly mix until combined. Roll dough into balls (should have about 40) and drop into a mini muffin pan. Bake 8 minutes and upon removal, press peanut butter cup into cookie. Let cool until easy to handle and remove to wire rack to school completely. And for those larger Reese’s Cups (not to mention the pumpkins and bats), you’re two purchases away from the easiest (and most awe-inducing) trifle you’ve ever made. Simply layer prepared instant chocolate pudding with cool whip and chopped Reese’s. You can make this gorgeous in a trifle bowl or just in a 9×13 glass dish.